The shower filter craze has been around for some time. It’s been so long I’m not sure it’s correct to even call it a craze. The tool was made, accidentally or not, very timely, to fill a common need. That’s why it got so popular in such a short period of time. And it doesn’t fade away like other typical trends. Instead, it hangs around, which does suggest that it works, doesn’t it? In fact, now it’s even more efficient than it once was as the tool has been upgraded quite a few times. That’s why everybody wants one. That’s why YOU want one. It’s understandable. But don’t rush right in just yet. Though Shower filters are not such expensive buys, acquiring an item without knowing what its functions are is just silly. You need information and confirmation on certain aspects to make a good final decision. So here are 10 things every single one of us should know when picking a shower filter. A shower water filter is exactly what it sounds like: a filter for shower water. Tap water might be safe for consumption, for cleaning, etc. But, for showering? Not so much. If your skin feels irritated and your hair feels dull after a supposedly refreshing shower, you may be under the effects of certain substances in the water. Here’s where shower filters come into play. They work to prevent those substances from touching your skin and hair by using suitable filtration methods as soon as they are attached to your existing shower arm. These methods use certain filtration media or combinations of media, including the popular KDF (Kinetic Degradation Fluxion) and GAC (Granular Active Carbon), to filter out contaminants. KDF exploits the redox reaction, whereas GAC physically absorbs and traps the molecules. Initially, it is meant to only filter out contaminants and make the water safer. Over time, the tool evolves and even goes as far as improving the water quality by releasing nurturing elements to better our skin and hair condition, which is a very welcomed change. For example, the current best seller – the AQUABLISS 12-STAGE – was able to overthrow the previous best seller because the Aquabliss 12-stage offers extra phases where it energizes the water with oxygen and minerals. Obviously, it works and people can feel the difference. Otherwise, the filter wouldn’t be such a big hit. 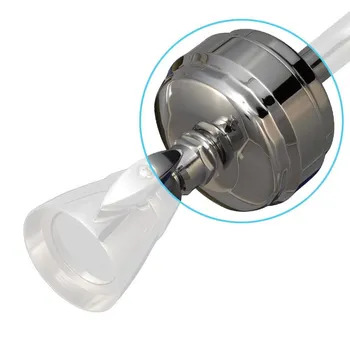 Filtered shower heads are shower heads or showerhead assemblies with a built-in filtration system which normally requires users to get rid of their existing shower head. In-line or portable shower filters are installed in between the existing shower head and the water supply line. They’re usually quite compact and require minimum effort to install. If we categorize them according to the target of filtration, there are (possibly) three types. Chlorine filters: This is the most common type and also the first type of shower filter. Chlorine filters mostly use media such as KDF, GAC or Calcium Sulfite. Chloramine filters: Though less harmful than chlorine, chloramine is still a health risk in the shower, especially with hot water. So far, the medium that sees the most success is vitamin C.
Fluoride filters: Lately there has been a rise in fluoride shower filters. To be honest, I don’t really understand why that is the case, since there aren’t many confirmations on the side effects of fluoride. Besides those three concerning agents, heavy metals (lead, mercury, etc. ), micro-organisms and uninvited organic growth are also targeted. Let’s talk about this in two folds. It’s known that even slightly contaminated tap water can have significant impacts on our appearance. To be specific, it is the heavy metals dissolved in water that react with soap and shampoo to form substances which dull and rough our skin and hair up. And showerhead water filters can definitely help. However, whether a showerhead water filter is necessary depends on how one prioritizes one’s look. Some believe in first impression and in how your looks could actively reflect your ego. Therefore, deeming a water filter to improve shower quality is necessary. On the flip side, some don’t even mind skin irritation to some extent, let alone rough looking hair strands. So you can see, it’s a 50/50 type of situation. HEALTH: HELL TO THE YES! We know that shower filters can reduce chlorine very quickly and effectively, more so compared to dealing with heavy metals. We also know that chlorine in a hot shower can be pretty harmful if we are not careful, as heat can turn free chlorine into gas, which enters our body through our eye sockets, skin and respiratory system. Exposure to chlorine can actually lead to a number of indications, including airway irritation, wheezing, difficulty breathing, sore throat, cough, chest tightness, eye irritation and skin irritation. For those multiple obvious reasons, a shower filter is absolutely and totally necessary. A shower filter has many benefits to the condition of one’s skin and hair. Another valuable trait that we can greatly benefit from is heavy metal removal. Soluble heavy metals and minerals in tap water are harmless via digestion, some are even beneficial. But when you wash yourself with soap and such using this water, chemical reactions will occur, leaving a film of soap curd sticking to our hair and skin, damaging and dulling them. Basically, showerhead water filters bring about a lot of perks to their users. The main focus here should be getting a good unit that does what it’s supposed to do. Once you’ve got that covered, it’s time to enjoy the shower. A KDF water filter is a filter that uses a KDF (Kinetic Degradation Fluxion) process medium for filtration. KDF, when it was first taken into use, acted as the main agent in most shower filters thanks to its cost-effective nature. Now, as more experiments and studies have been conducted, KDF is seen alone less because it is believed to work better and most effectively in conjunction with other media. There are several versions of KDF, including KDF 55, KDF 85, KDF-F (Fines) and KDF-C (Coarse Mesh). KDF 55 has been certified by the NSF to NSF/ANSI Standard 42, guaranteed to remove chlorine and taste/odor among other impurities. Found across a number of water filtration measures, KDF 55 can be said to be the most common choice for a cost-effective filtration medium. While KDF 55 is made to deal with chlorine and a number of heavy metals, KDF 85 is developed targeting the management of iron and hydrogen sulfide levels. With KDF already being affordable, durable and efficient, naturally many adopt KDF 85 in their well water filtration solutions. KDF-F (Fines) and KDF-C (Coarse Mesh) are variations of the 55 and 85. They are designed to serve particular purposes in certain circumstances. For example, the fine texture of KDF-F allows much better incorporation with carbon blocks, leading to higher efficiency. KDF 55 process medium is invented to remove chlorine and soluble heavy metals (lead, mercury, nickel, chromium, and other dissolved metals) by exploiting the oxidation/reduction, or redox, reaction. More specifically, KDF uses brass granules along with different percentages of zinc and copper alloy to form a filtering mass. When contaminated water flows through, an electrochemical reaction occurs, causing electrons to transfer between molecules and transform contaminants into harmless elements. Take chlorine for example. Free chlorine, when in contact with the filtration agent, will be broken down through the reaction into safe, water-soluble chloride. In a similar manner, dissolved heavy metals are changed and removed from the water as well. Besides all that, KDF 55 can also help control the buildup of bacteria, algae, fungi and scale in incorporation with other filtration strategies, like Granular Active Carbon (GAC) and carbon block filters, to name a few. First, let’s ask: does hard water have negative effects on skin and hair? The answer is YES. Soap in contact with hard water will combine with the dissolved metals and form a film of soap curd. The curd will stick to our hair, making it more and more lifeless and difficult to manage. In addition to that, the film will prevent filth and bacteria from being washed off and hinder the skin’s ability to recover back to its normal condition. In short, soft water rules all! Which begs the question: how do we effectively remove unwanted minerals and sediments from our water, or in other words, soften it? Since the problem is the main concern in the bathroom, shower filters seem like a decent choice. But the ultimate way to deal with this particular matter is a combination of a whole house water softener and a shower filter. If someone says that you only need shower filters to deal with the actual hard water, such as well water, they’re either misled, or they’re trying to sell you something. Think about it: out of many different kinds of residential water filters, only complex systems such as reverse osmosis filters can effectively remove minerals from water. How can a single, small unit of shower filter completely remove all the sediments and dissolved metals? It NEEDS help, as in support from a bulky assembly that will face the hard water head-on, like this Fleck 5600SXT which uses ion exchange mechanics – one of the few methods proved to be effective against hard water. How long does a shower filter last? A shower filter, similar to most products, is designed and made to last for a finite period of time. That finite number is different for each type of product. Some could last for years, some are subject to the matter of months. For showerhead water filters, half a year seems to be the most common case. A typical shower filter can handle 10,000 to 12,000 gallons of water, or 6 months of normal use, whichever comes first. Normal use here means a family of three or four with each member having a shower once every day. One more thing to note down: try to maintain regular replacement. The life capacity of shower filters is much like that of batteries. Once it has passed that a certain threshold, it won’t be useful any longer. After all the useful information above, one final question remains: what is the best shower filter? Well, right now on the market, there are several options that are worthy of being called “the best”. We have the reasonably priced Aquabliss 3-stage with KDF, Active carbon and Calcium Sulfite that once was everyone’s favorite; or the Vitamin C Inline Shower Filter Assembly by Sonaki that is incredibly efficient, albeit a bit expensive. However, to top them all is the current MVP of the shower filter game: the Aquabliss 12-stage. Being a combination of all the best filtration measures available, the shower filter really steps up and sets a higher bar for the entire industry.